These silicone baking pans are unique and original. 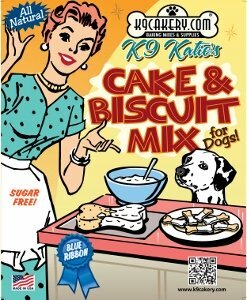 Manufactured by K9Cakery.com, they will offer you a chance to create dog treats that you can decorate and help your talents stand out. Read about some of the advantages of using silicone cake pans. Consider having a dog treat decorating day if you are a teacher! Kids will enjoy creating these wonderful, playful designs and then bringing the treats home for their dogs. How cute is that! Create mini fire hydrant dog treats. This silicone pan yields 15 of these mini fire hydrant shapes that are 1.5 inches in size. Don't stop at making these for dogs. Kids having fireman birthday parties - and adult firemen too - will delight and appreciate cookies in these shapes that can easily be decorated to resemble the real thing. Made out of heavyweight silicone, it can be used in the oven , the microwave, make frozen treats, and then pop it in the dishwasher for easy clean-up. It can be stomped on and will retain its shape! And if by chance the dog gets hold of it and tries to chew it, it will not easily be destroyed. Another unique, original design. This baking pan is made out of heavyweight silicone. It will not be easily destroyed! Use it in the oven, the microwave, or make frozen dog treats. Then, wash it in the dishwasher. Create 16 dog house shaped dog biscuits at are 1.5 inches in size. Save the time and energy of cutting these out with a cookie cutter. A person with joint pain may not be able to manipulate the cookie cutter without aggravating the pain, but will find that patting down a dog biscuit mix into the little wells will be easier to accomplish. 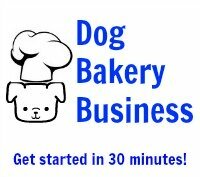 A staple of every dog bakery business: Dog bone cake pans. Paw print cake pans come in various sizes and are very popular for making dog treats. 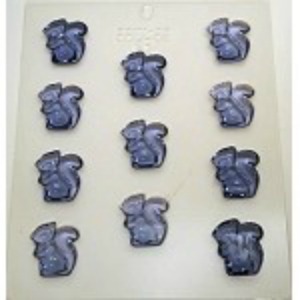 This squirrel candy mold is not made of silicone but is made out of plastic. Consider using this mold if you are having a dog themed party and need to make treats for the human guests. This mold works well for making candy, or for a treat mixture that does not require baking. It has 11 squirrel shaped cavities that are 1.5 inches in size.